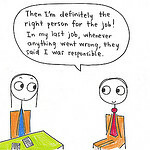 Home > Latest News > Job Hunting > Preparing for an interview > Do you Know How to tell YOUR story during a Job Interview? How do you react when an interviewer asks you to “Tell me about yourself?” For some of us, talking about ourselves can be really challenging. Yet we have invested time in creating our online personas on social media like LinkedIn. The way you have presented yourself there can help you with telling your story in person. But remember that it is also important to ensure that your online and offline personas are consistent – recruiters are increasingly looking at your social media presence before an interview and will pick up on inconsistencies very quickly. Read more.